When potheads Willie Nelson and Snoop Dogg were arrested on drug charges in Sierra Blanca, Texas, it made perfect sense. When Armie Hammer was arrested in Sierra Blanca, Texas, it was a little surprising, considering the young man’s clean-cut image; then we found out he was carrying his drugs in cookie form, and it made perfect sense. When Fiona Apple was arrested in Sierra Blanca, Texas, things got a little Fiona Apple–y for a while, but ultimately made perfect sense. 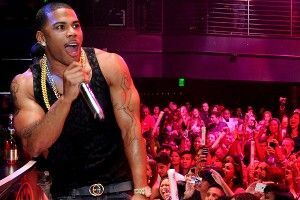 But now Nelly — the pop rapper of “Hot in Herre” fame — has gone and gotten himself in drug trouble in Sierra Blanca, Texas, and this one’s a bit harder to wrap your head around. According to TMZ, Nelly was caught with “36 small baggies of heroin (totaling .64 ounces) and over TEN POUNDS of marijuana inside a large green duffel bag (an amount roughly the size of a large bed pillow).” That’s right: a whole pillow’s worth of weed. Oh, right, and also a bunch of heroin. Yesterday, the strange tale was cleared up some. For one, TMZ now says the heroin was actually MDMA which, you know, all drugs are bad! and everything, but does seem to paint a less harrowing picture. Also, Nelly himself is avoiding any legal troubles. That’s because a fellow on his tour bus by the name of Brian Keith Jones stepped up and claimed possession of the narcotics. In a statement, Nelly said, “It is my understanding a member of my staff made an unfortunate decision to bring unlawful materials onto our tour bus that resulted in his arrest this morning. Neither I nor anyone else on the tour bus was aware of his decision to bring these on board. Law enforcement officials did not press charges against anyone other than that individual.” Member of the staff, huh? And what were this particular staff member’s duties, exactly? Would he, perhaps, been responsible for the transportation of narcotics? A “weed carrier,” to use the outdated-but-still-apt nomenclature? But we came here not to raise a skeptical eyebrow to Nelly’s legalese, but to celebrate the man. He knew he was rolling through the dastardly Sierra Blanca checkpoint, the one that had felled so many of his fellow celebrities. And so he took the proper precautions. No, not not having drugs, but rather making sure his weed carrier was onboard and prepared to carry out his professional obligations. Let this be a message to the future Lil Wayne and T.I.’s of the world: Remember! You are a famous rapper! You can pay someone else to handle your illegal business for you! By the way, you’d think that if your name was Brian Jones you’d heed the warnings of your infamous name-doppelganger, and stay away from drugs? But, hey, look, everyone’s gotta make their own decisions in this life.